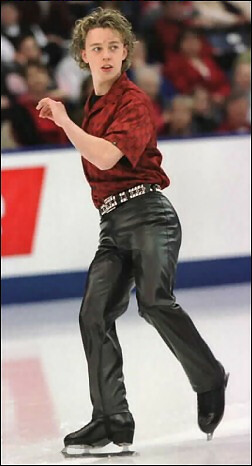 Figure Skater Ken Rose, Canada’s 2003 junior men’s champion, looks a lot like Elvis Stojko on the ice. Rose has shown the same determination, coming from behind to win at Canadians. He was so focused that he was able to avoid a pop can on the ice in the short program and still complete the required double Axel. Rose also came from behind to win the Junior Grand Prix in Scottsdale, Arizona, where he moved up from seventh to win the silver. With his win at Canadians, Rose made the junior international team, which means another chance to compete on the Junior Grand Prix circuit next season. It also afforded Rose a chance to compete at the World Junior Figure Skating Championships in Ostrava in the Czech Republic, where he finished 13th. Rose was 14 when he landed his first triple jump, a triple salchow. “My favorite jump is definitely the triple lutz,” Rose noted. “The combinations in my long program are triple lutz-triple toe and triple flip-triple toe. The combination in my short program is a triple flip-triple toe. Next year I’m hoping to add a triple Axel and a quad to my repertoire. I’ve tried quad toe loops and quad salchows,” he said. “I haven’t landed any cleanly yet, but I’ve had some close ones.